Re-form Used Office Furniture: Endless furniture options available. Refurbish Existing Furniture– The most inexpensive option if you have what you need but feel it needs updating. As-Is Furniture– Re-form purchases grade A, high-quality commercial used office furniture in excellent condition and current finishes. All As-Is office furniture is fully inspected, cleaned, touched up when needed, and supplied with keys. We buy it, bring it into our facility, catalog it and resell it “As-Is” for a fraction of the list price. Remanufactured Furniture – Re-form also purchases warehouse lots of grade A systems furniture, files, cubicles, and seating in various finishes. We then remanufacture the products to your specifications, which is a great way to get custom finishes at a significant savings compared to buying new. New Furniture – We represent dozens of quality manufacturers for specialty items just in case you can’t find exactly what you’re looking for. 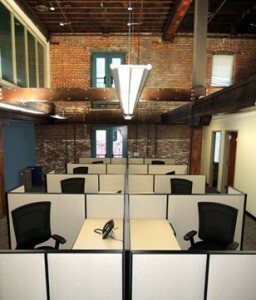 Design and Installation – Our design professionals know how to plan an office space. With years of experience performing office moves and reconfigurations, our Project Managers are familiar with a wide range of workstations and modular furniture, and have the expertise to make recommendations for any style or budget. And we provide delivery and installation services for the Mid-Atlantic region, and the ability to tap into a national installation network when our clients require out of state deliveries. The Re-form Installation team has been delivering and installing office furniture for decades, and has built and installed almost every single make and manufacturer of office furniture on the market. They are skilled craftsman who have a desire to make every installation look beautiful. Learn more from one of our furniture consultants – click “Let’s Talk” below.